Blurb: Easy to build metal brake with step by step instructions. Great for race car shops! 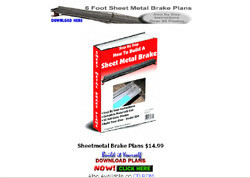 How to Build A Sheet Metal Brake is complete step by step instruction for building your own brake. Plans include detailed materials list, drawings and lots of photos to guide you through building a successful working sheet metal brake. Easily build your own sheet metal brake to make your own race car body parts. This sheet metal brake was designed for racers by a racer. With this brake you can keep your car looking great. These plans are for a basic metal brake and require cutting, drilling and welding mild steel. This sheet metal brake is designed for small work shops and fits any budget. Plans are easily scaled down for any desired length brake you desire.